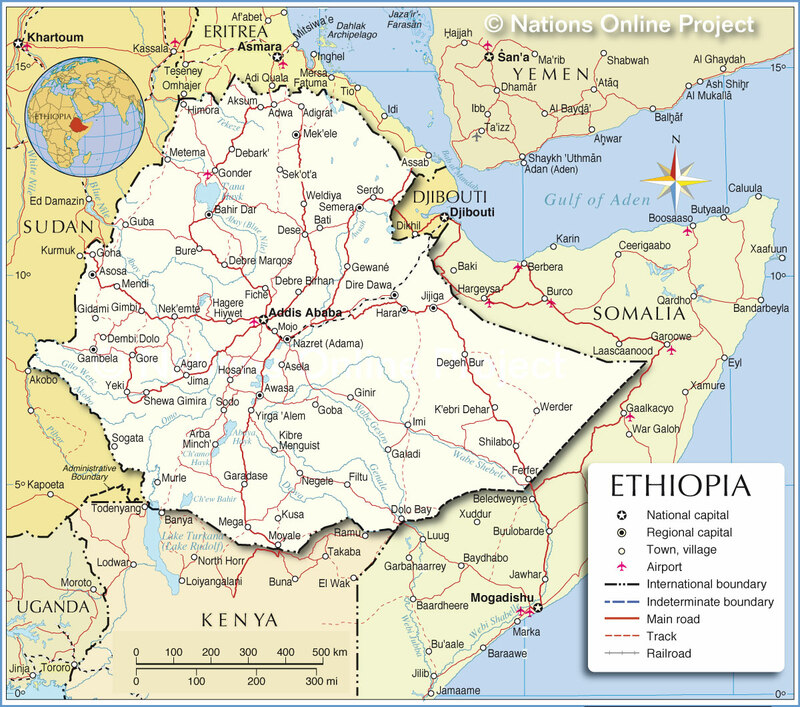 The Map is showing Ethiopia, a landlocked, mountainous country in northeastern Africa in the Horn of Africa. It is bordered by Djibouti, Eritrea, Kenya, Somalia, and Sudan. Ethiopia occupies an area of 1,104,300 km², compared it is twice the size of France or slightly less than twice the size of the U.S. state of Texas. The highest point in Ethiopia is Ras Dashen 4,550 m (14,928 ft) a peak in the Semien Mountains located north of Lake Tana (Tana Hayk). The African nation has a population of 90 million people (est. 2015). Capital and largest city is Addis Ababa. Spoken languages are Amharic (official) and several other Afro-Asiatic languages. Ethiopia's former name was Abyssinia. Depicted on the map is Ethiopia and the surrounding countries with international borders, the national capital Addis Ababa, province capitals, major cities, main roads, and major airports. Addis Ababa, Adigrat, Adwa, Agaro, Aksum (Axum), Arba Minch', Asela, Asosa, Awasa (Awassa), Bahir Dar, Bati, Bure, Debark', Debre Birhan, Debre Marqos, Degeh Bur, Dembi Dolo, Dese, Dire Dawa, Dolo Bay, Ferfer, Fiche, Filtu, Galadi, Gambela, Garadase, Gewané, Gidami, Gimbi, Ginir, Goba, Goha, Gonder, Gore, Guba, Hagere, Harar, Himora, Hiywet, Hosa'ina, Imi, Jijiga, Jima, K'ebri Dehar, Kibre Menguist, Kusa, Mega, Mek'ele, Mendi, Metema, Mojo, Moyale, Murle, Nazret (Adama), Negele, Nek'emte, Sek'ot'a, Semera, Serdo, Shewa Gimira, Shilabo, Sodo, Sogata, Weldiya, Werder, Yeki, and Yirga 'Alem.